Since I was a child I always had the sense of something more to life than what meets the eye. I spent my time reading and being in nature. My first teachers were my grandparents. My grandmother was fun-loving and very emotional and my grandfather had a daily spiritual practice. I carry them both with me now. When I was 11 I read my first book about personal and spiritual growth and that began a life-long passion. I was overweight until my early thirties. After many years of trying everything else, learning to accept my emotions and love myself as I was, allowed me to lose weight. I wrote a book called Eating my Way to God, A Food Addicts Journey to Freedom. This book is the book I wish I had when I was struggling with eating issues. My suffering with food and weight has taught me to understand other peoples suffering. I bring this sense of accepting people as they are to my work. I discovered yoga and meditation at 26. I was very anxious and self-critical and found it difficult to relax. I couldn’t even sit still long enough to take a bath. As I continued my practices I began to experience an inner stillness and more joy. At the same time I started counseling and began to learn that my ruthless inner critic had an opinion of me that I didn’t always have to share. The cloud of self-doubt I lived in was lifting and I began to feel more vibrant and effective. Sharing this experience of growth with others became a strong force within me. I decided I wanted to do counseling professionally and returned to school. In thirty years of practice I always have loved learning new techniques and tools to grow. It makes my work fresh and new as well as richly rewarding. My daughter has been a powerful teacher. Loving Monnya and being loved by her has stretched open my heart in a way I never thought possible. A single parent, I taught my daughter to trust in her own judgment as I learned to trust in mine. I also learned to ask for help. Monnya has inspired me in my writing and sculpting because of her dedication to creativity. Raising a true artist has helped me to learn to encourage others in the fullest expression of all that they are. Practicing hatha yoga as a student and now as a teacher gives me a chance to feel more flexible and powerful in my body and to share that with others . 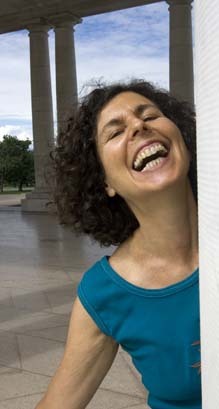 Laughter Yoga has given me an outlet for my silly playfulness and provides a good balance for my serious side. It is so much fun to bring laughter to others and to watch people melt their masks of self-protection and enjoy themselves. Three of my favorite things to do are connecting with people in a meaningful way, being in nature and moving my body around. I love hiking, walking and biking, alone and with friends. I also enjoy reading and meditating. Integrating mind, body and spirit and stretching into all that I am beyond my ideas of smallness have been a life-long journey. In it I embrace a deeper connection with myself, others and the universe. It is a great privilege to share this journey of growth with you.